The LGM-30 Minuteman is a U.S. land-based intercontinental ballistic missile (ICBM), in service with the Air Force Global Strike Command. As of 2018[update], the LGM-30G Minuteman III version[a] is the only land-based ICBM in service in the United States. Development of the Minuteman began in the mid-1950s and as the outgrowth of basic research into solid fuel rocket motors which indicated an ICBM based on solids was possible. Such a missile could stand ready for extended periods of time with little maintenance and then launch on command. In comparison, existing U.S. missile designs using liquid rocket propellant required a lengthy fueling process immediately before launch, which left them open to the possibility of a surprise attack. This potential for immediate launch gave the missile its name; like the Revolutionary War's Minutemen, the Minuteman was designed to be launched on a moment's notice. Minuteman entered service in 1962 as a weapon tasked primarily with the deterrence role, threatening Soviet cities with a second strike countervalue counterattack if the U.S. was attacked. However, the development of the U.S. Navy's Polaris missile, which addressed the same role, allowed the Air Force to modify Minuteman into a weapon with much greater accuracy with the specific intent of allowing it to attack hardened military targets, including Soviet missile silos. The Minuteman-II entered service in 1965 with a host of upgrades to improve its accuracy and survivability in the face of an anti-ballistic missile (ABM) system the Soviets were known to be developing. Minuteman-III followed in 1970, using three smaller warheads instead of one large one, which made it difficult to counter because the ABMs would have to hit all three widely separated warheads to be effective. Minuteman-III was the first multiple independently targetable reentry vehicle (MIRV) ICBM to be deployed. Each missile can carry up to three thermonuclear weapons, and were initially armed with the W62 warhead with a yield of 170 kilotons. Peaking at 1,000 missiles in the 1970s, the current U.S. force consists of 399 Minuteman-III missiles as of September 2017[update], deployed in missile silos around Malmstrom AFB, Montana; Minot AFB, North Dakota; and F.E. Warren AFB, Wyoming. The Air Force plans to keep the missile in service until at least 2030. It is one component of the U.S. nuclear triad—the other two parts of the triad being the Trident submarine-launched ballistic missile (SLBM), and nuclear weapons carried by long-range strategic bombers. Minuteman owes its existence largely to the efforts of the Air Force Colonel Edward N. Hall. In 1956, Hall was put in charge of the solid fuel propulsion division of General Schriever's Western Development Division, which had originally been formed to lead development of the Atlas and Titan ICBMs. Solid fuels were already commonly used in rockets, but strictly for short-range uses. Hall's superiors were interested in short and medium range missiles with solids, especially for use in Europe where the fast reaction time was an advantage for a system that might be attacked by Soviet aircraft. But Hall was convinced that they could be used for a true ICBM with 5,500 nautical miles (10,200 km; 6,300 mi) range. To achieve the required energy, that year Hall began funding research at Boeing and Thiokol into the use of ammonium perchlorate composite propellant. Adapting a concept developed in the UK, they cast the fuel into large cylinders with a star-shaped hole running along the inner axis. This allowed the fuel to burn along the entire length of the cylinder, rather than just the end as in earlier designs. The increased burn rate meant increased thrust. This also meant the heat was spread across the entire motor, instead of the end, and because it burned from the inside out it did not reach the wall of the missile fuselage until the fuel was finished burning. In comparison, older designs burned primarily from one end to the other, meaning that at any instant one small section of the fuselage was being subjected to extreme loads and temperatures. Guidance of an ICBM is based not only on the direction the missile is traveling but the precise instant that thrust is cut off. Too much thrust and the warhead will overshoot its target, too little and it will fall short. Solids are normally very hard to predict in terms of burning time and their instantaneous thrust during the burn, which made them questionable for the sort of accuracy required to hit a target at intercontinental range. This appeared at first to be an insurmountable problem, but in the end, was solved in an almost trivial fashion. A series of ports were added inside the rocket nozzle that was opened when the guidance systems called for engine cut-off. The reduction in pressure was so abrupt that the last burning fuel ejected itself and the flame was snuffed out. The first to make use of these developments was not the Air Force, but the Navy. They had been involved in a joint program with the US Army to develop the liquid-fueled Jupiter missile, but had always been skeptical of the system. They felt that liquid fuels were too dangerous to use onboard ships, and especially submarines. Rapid success in the solids development program, combined with Edward Teller's promise of much lighter nuclear warheads during Project Nobska, led the Navy to abandon Jupiter and begin development of a solid fuel missile of their own. Aerojet's work with Hall would be adapted for their Polaris missile starting in December 1956. The Air Force, however, saw no pressing need for a solid fuel ICBM. SM-65 Atlas and SM-68 Titan ICBMs were progressing, and "storable" liquids were being developed that would allow the missiles to be left in a ready-to-shoot form for extended periods. But Hall saw solid fuels not only as a way to improve launch times or safety, but part of a radical plan to greatly reduce the cost of ICBMs so that thousands could be built. He was aware that new computerized assembly lines would allow continual production, and that similar equipment would allow a small team to oversee operations for dozens or hundreds of missiles. A solid fuel design would be much simpler to build, and easier to maintain in service. Hall's ultimate plan was to build a number of integrated missiles "farms" that included factories, missile silos, transport and even recycling. Each farm would support between 1,000 and 1,500 missiles being produced in a continuous low rate cycle. Systems in a missile would detect failures, at which point it would be removed and recycled, while a newly built missile would take its place. The missile design itself was based purely on lowest possible cost, reducing its size and complexity because "the basis of the weapon's merit was its low cost per completed mission; all other factors – accuracy, vulnerability, and reliability – were secondary." Hall's plan did not go unopposed, especially by the more established names in the ICBM field. Ramo-Wooldridge pressed for a system with higher accuracy, but Hall countered that the missile's role was to attack Soviet cities, and that "a force which provides numerical superiority over the enemy will provide a much stronger deterrent than a numerically inferior force of greater accuracy." Hall was known for his "friction with others" and in 1958 Schriever removed him from the Minuteman project and sent him to the UK to oversee deployment of the Thor IRBM. On his return to the US in 1959, Hall retired from the Air Force, but received his second Legion of Merit in 1960 for his work on solid fuels. Although he was removed from the Minuteman project, Hall's work on cost reduction had already produced a new design of 71 inches (1.8 m) diameter, much smaller than the Atlas and Titan at 120 inches (3.0 m), which would mean much smaller and cheaper silos. Hall's goal of dramatic cost reduction was a success, although many of the other concepts of his missile farm were abandoned. Autonetics D-17 guidance computer from a Minuteman-I missile. Previous long-range missiles used liquid fuels that could only be loaded just prior to firing. The loading process took from 30 to 60 minutes in typical designs. Although lengthy, this was not considered to be a problem at the time, because it took about the same amount of time to spin up the inertial guidance system, set the initial position, and program in the target coordinates. Minuteman was designed from the outset to be launched in minutes. While solid fuel eliminated the fueling delays, the delays in starting and aligning the guidance system remained. For quick launch, the guidance system would have to be kept running and aligned at all times, which was a serious problem for the mechanical systems, especially the gyroscopes which used ball bearings. The last major advance was to use a general purpose digital computer in place of the analog or custom designed digital computers. Previous missile designs normally used two single-purpose computers; one ran the autopilot that kept the missile flying along a programmed course, and the second compared the information from the inertial platform to the target coordinates and sent any needed corrections to the autopilot. To reduce the total number of parts used in Minuteman, a single faster computer was used, running separate routines for these functions. Since the guidance computer would be inactive while the missile sat in the silo, the same computer was also used to run a program that monitored the various sensors and test equipment. With older designs this had been handled by external systems, requiring miles of extra wiring and many connectors. In order to store multiple programs, the computer, the D-17B, was built in the form of a drum machine but used a hard disk in place of the drum. Building a computer with the required performance, size and weight demanded the use of transistors, which were at that time very expensive and not very reliable. Earlier efforts to use transistorized computers for guidance, BINAC and the system on the SM-64 Navaho, had failed and were abandoned. The Air Force and Autonetics spent millions on a program to improve transistor and component reliability 100 times, leading to the "Minuteman high-rel parts" specifications. The techniques developed during this program were equally useful for improving all transistor construction, and greatly reduced the failure rate of transistor production lines in general. This improved yield, which had the effect of greatly lowering production costs, and had enormous spin-off effects in the electronics industry. Using a general purpose computer also had long-lasting effects on the Minuteman program and the US's nuclear stance in general. With Minuteman, the targeting could be easily changed by loading new trajectory information into the computer's hard drive, a task that could be completed in a few hours. Earlier ICBMs' custom wired computers, on the other hand, could only have attacked a single target, whose precise trajectory information was hard-coded directly in the system's logic. In 1957 a series of intelligence reports suggested the Soviets were far ahead in the missile race and would be able to overwhelm the US by the early 1960s. If the Soviets were building missiles in the numbers being predicted by the CIA and others within the defense establishment, by as early as 1961 they would have enough to attack all SAC and ICBM bases in the US in a single first strike. It was later demonstrated that this "missile gap" was just as fictional as the "bomber gap" of a few years earlier, but through the late 1950s, it was a serious concern. The Air Force responded by beginning research into survivable strategic missiles, starting the WS-199 program. Initially, this focused on air-launched ballistic missiles, which would be carried aboard aircraft flying far from the Soviet Union, and thus impossible to attack by either ICBM, because they were moving, or long-range interceptor aircraft, because they were too far away. 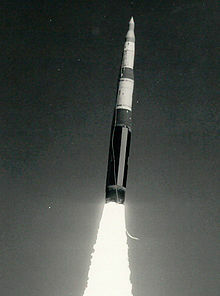 In the shorter term, looking to rapidly increase the number of missiles in its force, Minuteman was given crash development status starting in September 1958. Advanced surveying of the potential silo sites had already begun in late 1957. Adding to their concerns was a Soviet anti-ballistic missile system which was known to be under development at Sary Shagan. WS-199 was expanded to develop a maneuvering reentry vehicle (MARV), which greatly complicated the problem of shooting down a warhead. Two designs were tested in 1957, Alpha Draco and the Boost Glide Reentry Vehicle. These used long and skinny arrow-like shapes that provided aerodynamic lift in the high atmosphere, and could be fitted to existing missiles like Minuteman. The shape of these reentry vehicles required more room on the front of the missile than a traditional reentry vehicle design. To allow for this future expansion, the Minuteman silos were revised to be built 13 feet (4.0 m) deeper. Although Minuteman would not deploy a boost-glide warhead, the extra space proved invaluable in the future, as it allowed the missile to be extended and carry more fuel and payload. The Polaris SLBM could ostensibly fill the role of the Minuteman, and was perceived as significantly less vulnerable to attack. During Minuteman's early development, the Air Force maintained the policy that the manned strategic bomber was the primary weapon of nuclear war. Blind bombing accuracy on the order of 1,500 feet (0.46 km) was expected, and the weapons were sized to ensure even the hardest targets would be destroyed as long as the weapon fell within this range. The USAF had enough bombers to attack every military and industrial target in the USSR and was confident that its bombers would survive in great enough numbers that such a strike would utterly destroy the country. Soviet ICBMs upset this equation to a degree. Their accuracy was known to be low, on the order of 4 nautical miles (7.4 km; 4.6 mi), but they carried large warheads that would be useful against Strategic Air Command's bombers, which parked in the open. Since there was no system to detect the ICBMs being launched, the possibility was raised that the Soviets could launch a sneak attack with a few dozen missiles that would take out a significant portion of SAC's bomber fleet. In this environment, the Air Force saw their own ICBMs not as a primary weapon of war, but as a way to ensure that the Soviets would not risk a sneak attack. ICBMs, especially newer models that were housed in silos, could be expected to survive an attack by a single Soviet missile. In any conceivable scenario where both sides had similar numbers of ICBMs, the US forces would survive a sneak attack in sufficient numbers to ensure the destruction of all major Soviet cities in return. The Soviets would not risk an attack under these conditions. Considering this countervalue attack concept, strategic planners calculated that an attack of "400 equivalent megatons" aimed at the largest Soviet cities would promptly kill 30% of their population and destroy 50% of their industry. Larger attacks raised these numbers only slightly, as all of the larger targets would have already been hit. This suggested that there was a "finite deterrent" level around 400 megatons that would be enough to prevent a Soviet attack no matter how many missiles they had of their own. All that had to be ensured was that the US missiles survived, which seemed likely given the low accuracy of the Soviet weapons. Reversing the problem, the addition of ICBMs to the US Air Force's arsenal did not eliminate the need, or desire, to attack Soviet military targets, and the Air Force maintained that bombers were the only suitable platform in that role. This presented a serious problem for the Air Force. While still pressing for development of newer bombers, like the supersonic B-70, it appeared the counter value role was served by the Navy's UGM-27 Polaris. Polaris had enough range that the submarines could roam open areas of the ocean, and would be essentially invulnerable to attack no matter how many missiles the Soviets had, or how accurate they were. Based on the same 400 equivalent megatons calculation, they set about building a fleet of 41 submarines carrying 16 missiles each, giving the Navy a finite deterrent that was unassailable. A February 1960 memo by RAND, entitled "The Puzzle of Polaris", was passed around among high-ranking Air Force officials. It suggested that Polaris negated any need for Air Force ICBMs if they were also being aimed at Soviet cities; if the role of the missile was to present an unassailable threat to the Soviet population, Polaris was a far better solution than Minuteman. The document would have long-lasting effects on the future of the Minuteman program, which, by 1961, was firmly evolving towards a counterforce capability. Minuteman's final tests coincided with John F. Kennedy entering the White House. His new Secretary of Defense, Robert McNamara, was tasked with producing the world's best defense while limiting spending. McNamara began to apply cost/benefit analysis, and Minuteman's low production cost made its selection a foregone conclusion. Atlas and Titan were soon scrapped, and the storable liquid fueled Titan II deployment was severely curtailed. McNamara also cancelled the B-70 bomber project. Minuteman's low cost had spin-off effects on non-ICBM programs. The Army's Nike Zeus, an interceptor missile capable of shooting down Soviet warheads, provided another way to prevent a sneak attack. This had initially been proposed as a way to defend the SAC bomber fleet. The Army argued that upgraded Soviet missiles might be able to attack US missiles in their silos, and Zeus would be able to blunt such an attack. Zeus was expensive and the Air Force said it was more cost-effective to build another Minuteman missile. Given the large size and complexity of the Soviet liquid-fueled missiles, an ICBM building race was one the Soviets could not afford. Zeus was canceled in 1963. Minuteman's selection as the primary Air Force ICBM was initially based on the same "second strike" logic as their earlier missiles: that the weapon was primarily one designed to survive any potential Soviet attack and ensure they would be hit in return. But Minuteman had a combination of features that led to its rapid evolution into the US's primary weapon of nuclear war. Chief among these qualities was its digital computer. This could be updated in the field with new targets and better information about the flight paths with relative ease, gaining accuracy for little cost. One of the unavoidable effects on the warhead's trajectory was the mass of the Earth, which is not even, and contains many mass concentrations that pull on the warhead. Through the 1960s, the Defense Mapping Agency (now part of National Geospatial-Intelligence Agency) mapped these with increasing accuracy, feeding that information back into the Minuteman fleet. The Minuteman was deployed with a circular error probable (CEP) of about 1.1 nautical miles (2.0 km; 1.3 mi), but this had improved to about 0.6 nautical miles (1.1 km; 0.69 mi) by 1965. This was accomplished without any mechanical changes to the missile or its navigation system. At those levels, the ICBM begins to approach the manned bomber in terms of accuracy; a small upgrade, roughly doubling the accuracy of the INS, would give it the same 1,500 feet (460 m) CEP as the manned bomber. Autonetics began such development even before the original Minuteman entered fleet service, and the Minuteman-II had a CEP of 0.26 nautical miles (0.48 km; 0.30 mi). Additionally, the computers were upgraded with more memory, allowing them to store information for eight targets, which the missile crews could select among almost instantly, greatly increasing their flexibility. From that point, Minuteman became the US's primary deterrent weapon, until its performance was matched by the Navy's Trident missile of the 1980s. Questions about the need for the manned bomber were quickly raised. The Air Force began to offer a number of reasons why the bomber offered value, in spite of costing more money to buy and being much more expensive to operate and maintain. Newer bombers with better survivability, like the B-70, cost many times more than the Minuteman, and, in spite of great efforts through the 1960s, became increasingly vulnerable to surface-to-air missiles. The B-1 of the early 1970s eventually emerged with a price tag around $200 million (equivalent to $500 million in 2018) while the Minuteman-IIIs built during the 1970s cost only $7 million ($20 million in 2018). The Air Force countered that having a variety of platforms complicated the defense; if the Soviets built an effective anti-ballistic missile system of some sort, the ICBM and SLBM fleet might be rendered useless, while the bombers would remain. This became the nuclear triad concept, which survives into the present. Although this argument was successful, the number of manned bombers has been repeatedly cut and the deterrent role increasingly passed to missiles. The LGM-30A Minuteman-I was first test-fired on 1 February 1961, and entered into the Strategic Air Command's arsenal in 1962. After the first batch of Minuteman I's were fully developed and ready for stationing, the US Air Force had originally decided to put the missiles at the Vandenberg AFB in California, but before the missiles were set to officially be moved there it was discovered that this first set of Minuteman missiles had defective boosters which limited their range from their initial 6,300 miles to 4,300 miles. This defect would cause the missiles to to fall short of their targets if launched over the North Pole like planned. The decision was made to station the missiles at Malmstrom Air Force Base in Montana instead. These changes would allow the missiles, even with their defective boosters, to reach their intended targets in the case of a launch.. The "improved" LGM-30B Minuteman-I became operational at Ellsworth Air Force Base, South Dakota, Minot Air Force Base, North Dakota, F.E. Warren Air Force Base, Wyoming, and Whiteman Air Force Base, Missouri in 1963. All 800 Minuteman-I missiles were delivered by June 1965. Each of the bases had 150 missiles emplaced. F.E. Warren AFB had 200 of the Minuteman-IB missiles. Malmstrom AFB had 150 of the Minuteman-I and about five years later added 50 of the Minuteman-II similar to those installed at Grand Forks AFB, ND. The Minuteman I's length varied based on which variation one was to look at. The Minuteman I/A had a length of approx. 53 ft 8.0 in(≈16.4 m) and the Minuteman I/B had a an approx. length of 55 ft 11 in (≈17.0 m). The Minuteman I weighed roughly 65,000 lb (≈29,450 kg), had an operational range of 6,300 miles (≈10,130 km) with an accuracy of Approx. 1.5 miles (≈2.4 km). The Minuteman-I Autonetics D-17 flight computer used a rotating air bearing magnetic disk holding 2,560 "cold-stored" words in 20 tracks (write heads disabled after program fill) of 24 bits each and one alterable track of 128 words. The time for a D-17 disk revolution was 10 ms. The D-17 also used a number of short loops for faster access of intermediate results storage. The D-17 computational minor cycle was three disk revolutions or 30 ms. During that time all recurring computations were performed. For ground operations, the inertial platform was aligned and gyro correction rates updated. During a flight, filtered command outputs were sent by each minor cycle to the engine nozzles. Unlike modern computers, which use descendants of that technology for secondary storage on hard disk, the disk was the active computer memory. The disk storage was considered hardened to radiation from nearby nuclear explosions, making it an ideal storage medium. To improve computational speed, the D-17 borrowed an instruction look-ahead feature from the Autonetics-built Field Artillery Data Computer (M18 FADAC) that permitted simple instruction execution every word time. The D-37C guidance and control computers were used in Minuteman-II missiles and contained components from Texas Instruments. The Minuteman-III missiles used D-37D computers and completed the 1,000 missile deployment of this system. The initial cost of these computers ranged from about $139,000 (D-37C) to $250,000 (D-17B). The guidance system of the Minuteman-II was much smaller due to the use of integrated circuits. The inertial platform is in the top bay. The LGM-30F Minuteman-II was an improved version of the Minuteman-I missile. Development on the Minuteman-II began in 1962 as the Minuteman-I entered the Strategic Air Command's nuclear force. Minuteman-II production and deployment began in 1965 and completed in 1967. It had an increased range, greater throw weight and guidance system with better azimuthal coverage, providing military planners with better accuracy and a wider range of targets. Some missiles also carried penetration aids, allowing the higher probability of kill against Moscow's anti-ballistic missile system. The payload consisted of a single Mk-11C reentry vehicle containing a W56 nuclear warhead with a yield of 1.2 megatons of TNT (5 PJ). The Minuteman-II had a length of 57 ft 7.0 in (≈17.5 m), weighed roughly 73,000 lb (≈33,100 kg), had an operational range of 7,210 miles (≈11,600 km) with an accuracy of Approx. 1.0 miles (≈1.6 km). An improved first-stage motor to increase reliability. A novel, single, fixed nozzle with liquid injection thrust vector control on a larger second-stage motor to increase missile range. Additional motor improvements to increase reliability. An improved guidance system (D-37), incorporating microchips and miniaturized discrete electronic parts. Minuteman-II was the first program to make a major commitment to these new devices. Their use made possible multiple target selection, greater accuracy and reliability, a reduction in the overall size and weight of the guidance system, and an increase in the survivability of the guidance system in a nuclear environment. The guidance system contained 2,000 microchips made by Texas Instruments. A penetration aids system to camouflage the warhead during its reentry into an enemy environment. In addition, the Mk-11C reentry vehicle incorporated stealth features to reduce its radar signature and make it more difficult to distinguish from decoys. The Mk-11C was no longer made of titanium for this and other reasons. A larger warhead in the reentry vehicle to increase kill probability. System modernization was concentrated on launch facilities and command and control facilities. This provided decreased reaction time and increased survivability when under nuclear attack. Final changes to the system were performed to increase compatibility with the expected LGM-118A Peacekeeper. These newer missiles were later deployed into modified Minuteman silos. 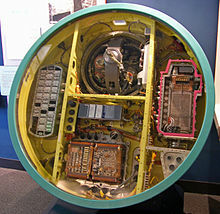 The Minuteman-II program was the first mass-produced system to use a computer constructed from integrated circuits (the Autonetics D-37C). The Minuteman-II integrated circuits were diode–transistor logic and diode logic made by Texas Instruments. The other major customer of early integrated circuits was the Apollo Guidance Computer, which had similar weight and ruggedness constraints. The Apollo integrated circuits were resistor–transistor logic made by Fairchild Semiconductor. The Minuteman-II flight computer continued to use rotating magnetic disks for primary storage. The Minuteman-II included diodes by Microsemiconductor. Airmen work on a Minuteman-III's multiple independently-targetable re-entry vehicle (MIRV) system. Current missiles carry a single warhead. A Minuteman III ICBM test launch from Vandenberg Air Force Base, United States. The LGM-30G Minuteman-III program started in 1966 and included several improvements over the previous versions. It was first deployed in 1970. Most modifications related to the final stage and reentry system (RS). The final (third) stage was improved with a new fluid-injected motor, giving finer control than the previous four-nozzle system. Performance improvements realized in Minuteman-III include increased flexibility in reentry vehicle (RV) and penetration aids deployment, increased survivability after a nuclear attack, and increased payload capacity. The missile retains a gimballed inertial navigation system. Armed with W62 warhead, having a yield of only 170 kilotons TNT, instead of previous W56's yield of 1.2 megatons. It was the first Multiple Independently Targetable Reentry Vehicles (MIRV) missile. A single missile was then able to target 3 separate locations. This was an improvement from the Minuteman-I and Minuteman-II models, which were only able to carry one large warhead. An RS capable of deploying, in addition to the warheads, penetration aids such as chaff and decoys. Minuteman-III introduced in the post-boost-stage ("bus") an additional liquid-fuel propulsion system rocket engine (PSRE) that is used to slightly adjust the trajectory. This enables it to dispense decoys or – with MIRV – dispense individual RVs to separate targets. For the PSRE it uses the bipropellant Rocketdyne RS-14 engine. The Hercules M57 third stage of Minuteman-I and Minuteman-II had thrust termination ports on the sides. These ports, when opened by a detonation of shaped charges, reduced the chamber pressure so abruptly that the interior flame was blown out. This allowed a precisely timed termination of thrust for targeting accuracy. The larger Minuteman-III third-stage motor also has thrust termination ports although the final velocity is determined by PSRE. A fixed nozzle with a liquid injection thrust vector control (TVC) system on the new third-stage motor (similar to the second-stage Minuteman-II nozzle) additionally increased range. A flight computer (Autonetics D37D) with larger disk memory and enhanced capability. A Honeywell HDC-701 flight computer which employed non-destructive readout (NDRO) plated wire memory instead of rotating magnetic disk for primary storage was developed as a backup for the D37D but was never adopted. The Guidance Replacement Program (GRP), initiated in 1993, replaced the disk-based D37D flight computer with a new one that uses radiation-resistant semiconductor RAM. 6. The RVs, as well as decoys and chaff, are deployed during back away. 8. The nuclear warheads initiate, either as air bursts or ground bursts. The existing Minuteman-III missiles have been further improved over the decades in service, with more than $7 billion spent in the last decade to upgrade the 450 missiles. The Minuteman-III had a length of 59 ft 9.5 in (≈18.2 m), weighed roughly 78,000 lb (≈35,300 kg), had an operational range of 8,083 miles (≈13,000 km) with an accuracy of Approx. 800 feet (≈243 m). In December 1979 the higher-yield W78 warhead began replacing a number of the W62s deployed on the Minuteman-IIIs. These were delivered in the Mark 12A reentry vehicle. A small, unknown number of the previous Mark 12 RVs were retained operationally, however, to maintain a capability to attack more-distant targets in the south-central Asian republics of the USSR (the Mark 12 RV weighed slightly less than the Mark 12A). The Guidance Replacement Program (GRP) replaces the NS20A Missile Guidance Set with the NS50A Missile Guidance Set. The newer system extends the service life of the Minuteman missile beyond the year 2030 by replacing aging parts and assemblies with current, high-reliability technology while maintaining the current accuracy performance. The replacement program was completed 25 February 2008. Beginning in 1998 and continuing through 2009, the Propulsion Replacement Program extends the life and maintains the performance by replacing the old solid propellant boosters (downstages). The Single Reentry Vehicle (SRV) modification enabled the United States ICBM force to abide by the now-vacated START II treaty requirements by reconfiguring Minuteman-III missiles from three reentry vehicles down to one. Though it was eventually ratified by both parties, START II never entered into force and was essentially superseded by follow-on agreements such as SORT and New START, which do not limit MIRV capability. Minuteman III remains fitted with a single warhead due to the warhead limitations in New START. Beginning in 2005, Mk-21/W87 RVs from the deactivated Peacekeeper missile will be placed on the Minuteman-III force under the Safety Enhanced Reentry Vehicle (SERV) program. The older W78 does not have many of the safety features of the newer W87, such as insensitive high explosive, as well as more advanced safety devices. In addition to implementing these safety features in at least a portion of the future Minuteman-III force, the decision to transfer W87s onto the missile is based on two features that will improve the targeting capabilities of the weapon: more fuzing options which will allow for greater targeting flexibility and the most accurate reentry vehicle available which provides a greater probability of damage to the designated targets. The Airborne Launch Control System (ALCS) is an integral part of the Minuteman ICBM command and control system and provides a survivable launch capability for the Minuteman ICBM force if ground-based Launch Control Centers are destroyed. When the Minuteman ICBM was first placed on alert, the Soviet Union did not have the number of weapons, accuracy, nor significant nuclear yield to completely destroy the Minuteman ICBM force during an attack. However, starting in the mid-1960s, the Soviets began to gain parity with the US and now had the potential capability to target and successfully attack the Minuteman force with an increased number of ICBMs that had greater yields and accuracy than were previously available. Studying the problem, even more, SAC realized that in order to prevent the US from launching all 1000 Minuteman ICBMs, the Soviets did not have to target all 1000 Minuteman missile silos. The Soviets only needed to launch a disarming decapitation strike against the 100 Minuteman LCCs – the command and control sites – in order to prevent the launch of all Minuteman ICBMs. Even though the Minuteman ICBMs would have been left unscathed in their missile silos following an LCC decapitation strike, the Minuteman missiles could not be launched without a command and control capability. In other words, the Soviets only needed 100 warheads to fully eliminate command and control of the Minuteman ICBMs. Even if the Soviets chose to expend two to three warheads per LCC for assured damage expectancy, the Soviets would only have had to expend up to 300 warheads to disable the Minuteman ICBM force – far less than the total number of Minuteman silos. The Soviets could have then used the remaining warheads to strike other targets they chose. 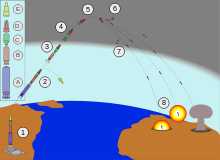 Faced with only a few Minuteman LCC targets, the Soviets could have concluded that the odds of being successful in a Minuteman LCC decapitation strike were higher with less risk than it would have been having to face the almost insurmountable task of successfully attacking and destroying 1000 Minuteman silos and 100 Minuteman LCCs to ensure Minuteman was disabled. This theory motivated SAC to design a survivable means to launch Minuteman, even if all the ground-based command and control sites were destroyed. After thorough testing and modification of EC-135 command post aircraft, the ALCS demonstrated its capability on 17 April 1967 by launching an ERCS configured Minuteman II out of Vandenberg AFB, CA. Afterward, ALCS achieved Initial Operational Capability (IOC) on 31 May 1967. From that point on, airborne missileers stood alert with ALCS-capable EC-135 aircraft for several decades. All Minuteman ICBM Launch Facilities were modified and built to have the capability to receive commands from ALCS. With ALCS now standing alert around-the-clock, the Soviets could no longer successfully launch a Minuteman LCC decapitation strike. Even if the Soviets attempted to do so, EC-135s equipped with the ALCS could fly overhead and launch the remaining Minuteman ICBMs in retaliation. Now that ALCS was on alert, this complicated Soviet war planning by forcing the Soviets to not only target the 100 LCCs, but also the 1000 silos with more than one warhead in order to guarantee destruction. This would have required upwards of 3000 warheads to complete such an attack. The odds of being successful in such an attack on the Minuteman ICBM force would have been extremely low. Today, the ALCS is operated by airborne missileers from Air Force Global Strike Command's (AFGSC) 625th Strategic Operations Squadron (STOS) and United States Strategic Command (USSTRATCOM). The weapon system is now located on board the United States Navy's E-6B Mercury. The ALCS crew is integrated into the battle staff of the USSTRATCOM "Looking Glass" Airborne Command Post (ABNCP) and is on alert around-the-clock. Although the Minuteman ICBM force has been reduced since the end of the Cold War, the ALCS continues to act as a force multiplier by ensuring that an adversary cannot launch a successful Minuteman LCC decapitation strike. The Minuteman-III missile entered service in 1970, with weapon systems upgrades included during the production run from 1970 to 1978 to increase accuracy and payload capacity. As of 2016[update], the USAF plans to operate it until 2030. The LGM-118A Peacekeeper (MX) ICBM, which was to have replaced the Minuteman, was retired in 2005 as part of START II. A total of 450 LGM-30G missiles are emplaced at F.E. Warren Air Force Base, Wyoming (90th Missile Wing), Minot Air Force Base, North Dakota (91st Missile Wing), and Malmstrom Air Force Base, Montana (341st Missile Wing). All Minuteman I and Minuteman II missiles have been retired. The United States prefers to keep its MIRV deterrents on submarine-launched Trident Nuclear Missiles. Fifty of these will be put into "warm" unarmed status[when? 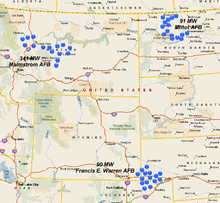 ], taking up half of the 100 slots in America's allowable nuclear reserve. Minuteman-III missiles are regularly tested with launches from Vandenberg Air Force Base in order to validate the effectiveness, readiness, and accuracy of the weapon system, as well as to support the system's primary purpose, nuclear deterrence. 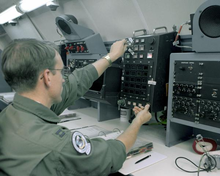 The safety features installed on the Minuteman-III for each test launch allow the flight controllers to terminate the flight at any time if the systems indicate that its course may take it unsafely over inhabited areas. Since these flights are for test purposes only, even terminated flights can send back valuable information to correct a potential problem with the system. The 576th Flight Test Squadron is responsible for planning, preparing, conducting, and assessing all ICBM ground and flight tests. The Minuteman Missile National Historic Site in South Dakota preserves a Launch Control Facility (D-01) and a launch facility (D-09) under the control of the National Park Service. The North Dakota State Historical Society maintains the Ronald Reagan Minuteman Missile Site, preserving a Missile Alert Facility, Launch Control Center and Launch Facility in the WS-133B "Deuce" configuration, near Cooperstown, North Dakota. For the subsequent plans for Peacekeeper Rail Garrison and Soviet Scalpel rail basing, see LGM-118A and SS-24. Some effort was given to a mobile version of Minuteman to improve its survivability, but this was later cancelled. Mobile Minuteman was a program for rail-based ICBMs to help increase survivability and for which the USAF released details on 12 October 1959. The Operation Big Star performance test was from 20 June to 27 August 1960 at Hill Air Force Base, and the 4062nd Strategic Missile Wing (Mobile) was organized 1 December 1960 for 3 planned missile train squadrons, each with 10 trains carrying 3 missiles per train. During the Kennedy/McNamara cutbacks, the DoD announced "that it has abandoned the plan for a mobile Minuteman ICBM. The concept called for 600 to be placed in service—450 in silos and 150 on special trains, each train carrying 5 missiles." After Kennedy announced on 18 March 1961, that the 3 squadrons were to be replaced with "fixed-base squadrons", Strategic Air Command discontinued the 4062nd Strategic Missile Wing on 20 February 1962. Air Launched ICBM was a STRAT-X proposal in which SAMSO (Space & Missile Systems Organization) successfully conducted an Air Mobile Feasibility Test that airdropped a Minuteman 1b from a C-5A Galaxy aircraft from 20,000 ft (6,100 m) over the Pacific Ocean. The missile fired at 8,000 ft (2,400 m), and the 10-second engine burn carried the missile to 20,000 feet again before it dropped into the ocean. Operational deployment was discarded due to engineering and security difficulties, and the capability was a negotiating point in the Strategic Arms Limitation Talks. An additional part of the National Command Authority communication relay system was called the Emergency Rocket Communication System (ERCS). Specially designed rockets called BLUE SCOUT carried radio-transmitting payloads high above the continental United States, to relay messages to units within line-of-sight. In the event of a nuclear attack, ERCS payloads would relay pre-programmed messages giving the "go-order" to SAC units. BLUE SCOUT launch sites were located at Wisner, West Point and Tekamah, Nebraska. These locations were vital for ERCS effectiveness due to their centralized position in the US, within range of all missile complexes. Later ERCS configurations were placed on the top of modified Minuteman-II ICBMs (LGM-30Fs) under the control of the 510th Strategic Missile Squadron located at Whiteman Air Force Base, Missouri. The Minuteman ERCS may have been assigned the designation LEM-70A. The U.S. Air Force has considered using some decommissioned Minuteman missiles in a satellite launching role. These missiles would be stored in silos, for launch upon short notice. The payload would be variable and would have the ability to be replaced quickly. This would allow a surge capability in times of emergency. During the 1980s, surplus Minuteman missiles were used to power the Conestoga rocket produced by Space Services Inc. of America. It was the first privately developed rocket, but only saw three flights and was discontinued due to a lack of business. More recently, converted Minuteman missiles have been used to power the Minotaur line of rockets produced by Orbital Sciences. L-3 Communications is currently using SR-19 SRBs, Minuteman-II Second Stage Solid Rocket Boosters, as delivery vehicles for a range of different re-entry vehicles as targets for the THAAD and ASIP interceptor missile programs as well as radar testing. United States: The United States Air Force has been the only operator of the Minuteman ICBM weapons system, currently with three operational wings and one test squadron operating the LGM-30G. The active inventory in FY 2009 is 450 missiles and 45 Missile Alert Facilities (MAF). The basic tactical unit of a Minuteman wing is the squadron, consisting of five flights. Each flight consists of ten unmanned launch facilities (LFs) which are remotely controlled by a manned launch control center (LCC). The five flights are interconnected and status from any LF may be monitored by any of the five LCCs. Each LF is located at least three nautical miles (5.6 km) from any LCC. Control does not extend outside the squadron (thus the 319th Missile Squadron's five LCCs cannot control the 320th Missile Squadron's 50 LFs even though they are part of the same Missile Wing). Each Minuteman wing is assisted logistically by a nearby Missile Support Base (MSB). If the ground-based LCCs are destroyed or incapacitated, the Minuteman ICBMs can be launched by airborne missileers utilizing the Airborne Launch Control System. 90th Missile Wing – "Mighty Ninety"
319th Missile Squadron – "Screaming Eagles"
320th Missile Squadron – "G.N.I." 321st Missile Squadron – "Frontier Warriors"
91st Missile Wing – "Roughriders"
740th Missile Squadron – "Vulgar Vultures"
741st Missile Squadron – "Gravelhaulers"
742d Missile Squadron – "Wolf Pack"
10th Missile Squadron – "First Aces"
12th Missile Squadron – "Red Dawgs"
490th Missile Squadron – "Farsiders"
Inactivated 1994 when Minuteman-II phased out of inventory. All retired between 3 December 1991 and April 1994, with destruction of silos and alert facilities finishing in 1996. Inactivated by BRAC 1995; missiles reassigned to 341st SMW, however in 1995 it was decided to retire the Grand Forks missiles; the last missile was pulled from its silo in June 1998. Destruction of silos and control facilities began in October 1999; the last silo (H-22) was imploded 24 August 2001 (the last US silo destroyed per the 1991 START-I treaty). The 510th SMS operated Emergency Rocket Communication System (ERCS) missiles in addition to Minuteman II ICBMs. The 351st SMW was inactivated under START-I. The first silo was imploded on 8 December 1993 and the last on 15 December 1997. 576th Flight Test Squadron – Vandenberg Air Force Base, California – "Top Hand"
A request for proposal for development and maintenance of a Ground Based Strategic Deterrent next-generation nuclear ICBM, was made by the US Air Force Nuclear Weapons Center, ICBM Systems Directorate, GBSD Division on 29 July 2016. The GBSD would become the land-based portion of the US Nuclear Triad. The new missile to be phased in over a decade from the late 2020s are estimated over a fifty-year life cycle to cost around $86 billion. Boeing, Lockheed Martin, and Northrop Grumman are competing for the contract. On 21 August 2017, the US Air Force awarded 3-year development contracts to Boeing and Northrop Grumman, for $349 million and $329 million, respectively. One of these companies will be selected to produce this ground-based nuclear ICBM in 2020. In 2027 the GBSD program is expected to enter service and remain active until 2075. ^ The letter "L" in "LGM" indicates that the missile is silo-launched; the "G" indicates that it is designed to attack ground targets; the "M" indicates that it is a guided missile. ^ A third gyro was later added for other reasons. ^ Bott, Mitch (21 September 2009). "Unique and Complementary Characteristics of the U.S. ICBM and SLBM Weapons Systems" (PDF). Center for Strategic and International Studies. p. 76. Archived from the original (PDF) on 4 March 2016. Retrieved 25 January 2019. .
^ Bott, Mitch; et al. [presented by] (28 August 2009), Discussion of the Unique and Complementary Characteristics of the ICBM and SLBM Weapon Systems / Project on Nuclear Issues / August 6–7 2009 (PDF), Northrop Grumman, p. 5, archived from the original (PDF (PowerPoint)) on 2 June 2013, retrieved 25 January 2019 CS1 maint: Multiple names: authors list (link). ^ "The Minuteman III ICBM". nuclearweaponarchive.org. 7 October 1997. Retrieved 25 January 2019. ^ "New START Treaty Aggregate Numbers of Strategic Offensive Arms". state.gov. ^ a b "Photo Release – Northrop Grumman/Air Force Complete Guidance Upgrade Installations on Minuteman III ICBMs (NYSE:NOC)". Irconnect.com. 11 March 2008. Retrieved 25 October 2017. ^ "Earmark Disclosure 81542, Minuteman III Solid Rocket Motor Warm Line Program (SRMWL)". WashingtonWatch.com. 14 March 2011. Retrieved 20 March 2011. ^ a b c MacKenzie 1993, p. 152. ^ a b MacKenzie 1993, p. 153. ^ a b c d MacKenzie 1993, p. 154. ^ a b c MacKenzie 1993, p. 156. ^ a b MacKenzie 1993, p. 157. ^ a b MacKenzie 1993, p. 159. ^ a b MacKenzie 1993, p. 160. ^ MacKenzie 1993, pp. 160–161. ^ a b c Yengst 2010, p. 46. ^ a b c MacKenzie 1993, p. 202. ^ a b MacKenzie 1993, p. 199. ^ a b MacKenzie 1993, p. 197. ^ MacKenzie 1993, p. 203. ^ Kaplan, Fred (2008). Daydream Believers: How a Few Grand Ideas Wrecked American Power. John Wiley & Sons. p. 81. ISBN 9780470121184. ^ MacKenzie 1993, p. 166. ^ "US NUCLEAR AND EXTENDED DETERRENCE" (PDF). ^ "Triad, Dyad, Monad?" (PDF). ^ a b "Minutemen missile fired successfully". Lewiston Morning Tribune. (Idaho). Associated Press. 2 February 1961. p. 1. ^ "The 6555th, Chapter III, Section 8, The MINUTEMAN Ballistic Missile Test Program". Fas.org. Retrieved 20 March 2011. ^ a b c d Winkler, David F.; Lonnquest, John C. (1 November 1996). "To Defend and Deter: The Legacy of the United States Cold War Missile Program". ^ a b c Polmar, Norman. (2009). The U.S. nuclear arsenal : a history of weapons and delivery systems since 1945. Norris, Robert S. (Robert Stan). Annapolis, Md. : Naval Institute Press. ISBN 9781557506818. OCLC 262888426. ^ Bowman, Norman J. (1963). The handbook of rockets and guided missiles. Newton Square, Pa., Perastadion Press. p. 346. ^ The Innovators: How a Group of Inventors, Hackers, Geniuses, and Geeks Created the Digital Revolution, Walter Isaacson, Simon & Schuster, 2014, p.181. ^ "missiles and rockets, the weekly of space systems engineering". Judd & Detweiler. 3 February 1964. Retrieved 31 March 2016. ^ "Complete List of All U.S. Nuclear Weapons". Retrieved 9 February 2011. ^ "Multiple Independently Targetable Reentry Vehicles (MIRVs)". Retrieved 20 November 2015. ^ Pampe, Carla (25 October 2012). "Life Extension Programs modernize ICBMs". Retrieved 20 November 2015. ^ "The W-78 Warhead". High Energy Weapons Archive. Carey Sublette. Retrieved 7 December 2016. ^ a b "ALCS Article, page 13" (PDF). afmissileers.com. ^ a b "ALCS Article, page 14" (PDF). afmissileers.com. ^ "U.S. Strategic Command > About > Factsheets". www.stratcom.mil. ^ Woolf, Amy (10 March 2016). "U.S. Strategic Nuclear Forces: Background, Developments, and Issues" (PDF). fas.org. Congressional Research Service. Retrieved 25 March 2016. ^ "Trident Fleet Ballistic Missile". United States Navy. Retrieved 20 November 2015. ^ Kristensen, Hans M. (9 April 2014). "Obama Administration Decision Weakens New START Implementation". fas.org. Federation of American Scientists. Archived from the original on 13 April 2014. Retrieved 9 April 2014. ^ Burns, Robert (26 February 2016). "U.S. continues to test Cold War-era Minuteman missiles". Portland Press Herald. Portland, Oregon. Retrieved 13 August 2016. ^ "Minuteman Test Firing Aborted Over Pacific". Los Angeles Times. Los Angeles, California. 6 February 1985. Retrieved 13 August 2016. ^ "MInuteman Missile". National Park Service. Retrieved 12 June 2016. ^ "Ronald Reagan Minuteman Missile Site". North Dakota State Government. Retrieved 12 June 2016. ^ "Minuteman: The West's Biggest Missile Programme". Flight: 844. 21 December 1961. ^ 99 – Special Message to the Congress on the Defense Budget. (Kennedy speech), The three mobile Minuteman squadrons funded in the January budget should be deferred for the time being and replaced by three more fixed-base squadrons (thus increasing the total number of missiles added by some two-thirds). Development work on the mobile version will continue. ^ Parsch, Andreas (2002). "Boeing LEM-70 Minuteman ERCS". Directory of U.S. Military Rockets and Missiles. designation-systems.net. Retrieved 10 January 2011. ^ a b "A History of PACCS, ACCS and ALCS, page 1" (PDF). sac-acca.org. ^ "4th ACCS" (PDF). sac-acca.org. ^ "2 ACCS Part 1" (PDF). sac-acca.org. ^ "2 ACCS Part 2" (PDF). sac-acca.org. ^ "625th Strategic Operations Squadron". af.mil. ^ Affairs, 55th Wing Public. "625th Strategic Operations Squadron Activated at Offutt AFB". www.missilenews.com. ^ "Home page of Hill Air Force Base". www.hill.af.mil. ^ "Vandenberg Air Force Base > Home". www.vandenberg.af.mil. ^ "Boeing Ready to Design Next Generation of US Nuclear Missiles". spacedaily.com. ^ "US Air Force set to replace intercontinental nuke arsenal". spacedaily.com. ^ Aaron Gregg Washington Post (21 August 2017) "Pentagon narrows competition for the next big U.S. nuclear missile"
^ "Boeing, Northrop Grumman receive development contracts for new ICBM". spacedaily.com. Heefner, Gretchen (2012). The Missile Next Door: The Minuteman in the American Heartland. Cambridge, MA: Harvard University Press. Lloyd, A. (2000). Cold War Legacy: A Tribute to the Strategic Air Command: 1946–1992. New York: Turner Publishing. MacKenzie, Donald (1993). Inventing Accuracy: A Historical Sociology of Missile Guidance. MIT Press. McMurran, Marshall William (2008). Achieving Accuracy: A Legacy of Computers and Missles. Xlibris. ISBN 9781436381079. Neal, Roy. (1962). Ace in the Hole: The Story of the Minuteman Missile. New York: Doubleday & Company. TRW Systems (2001). Minuteman Weapon System History and Description. Yengst, William (April 2010). Lightning Bolts: First Maneuvering Reentry Vehicles. Tate Publishing. ISBN 9781615665471. Zuckerman, E. (1984). The Day after World War III. New York: Viking Press. The Boeing Corporation (1973). Technical Order 21M-LGM30G-1-1: Minuteman Weapon System Description. Seattle: Boeing Aerospace. Contains basic weapon descriptions. The Boeing Corporation (1973). Technical Order 21M-LGM30G-1-22: Minuteman Weapon System Operations. Seattle: Boeing Aerospace. Operators Manual. The Boeing Corporation (1994). Technical Order 21M-LGM30G-2-1-7: Organizational Maintenance Control, Minuteman Weapon System. Seattle: Boeing Aerospace. Operators Manual. Wikimedia Commons has media related to Minuteman.